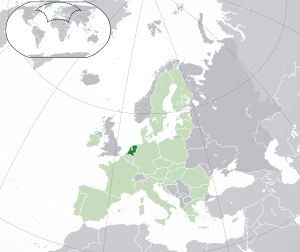 This wiki cheese category page contains detailed information and photographs of cheeses produced in the european country of The Netherlands. Cheese is synonymous with the Netherlands where recorded cheese-making goes back at least 800 years. Its most famous ones are Edam, Gouda and Maasdammer and many of their other cheeses are based on them. However, the Netherlands is now beginning to produce more specialised varieties, including those made with milk other than from cows, although these are generally not being exported to the UK at the time of writing. If your opinion of Dutch cheeses has been tainted by cheap Edam, hardly better than processed cheese, prepare to be amazed, seek out an Oud Gouda, [Old Gouda]. These aged Goudas are as good as some the very best mature cheddars, often complete with little crunchy, salty packets of flavour. Absolutely wonderful cheeses, after a month spent in The Netherlands, I am a total convert. We also have a Dutch recipe category. Pages in category "Dutch cheeses"
Page modified 12:19, 19 January 2017.